Vocal pedagogues have been peddling the idea of voice placement for a very long time, perhaps the most famous being Francesco Lamperti, who taught his students to listen to the center of the head whilst singing sotto voce. Here's the thing, and my thing about this whole thing: Should Mr. Polenzani be robbed of his audio-vocal control—that's what we're dealing with here actually—because science tells him the vocal tract is the only resonator, and that his facial cavities make no contribution to vocal tone? Should he stop listening to his voice in front of his eyes? I do not believe so. Unlike some of my colleagues, I take Mr. Polenzani's self-observation to be an actual phenomenon rather than a matter of self-delusion. What accounts for it? The short answer is the ear, specifically in how it processes and perceives vocal tone. I tackled this matter head-on in my introduction to Hidden in Plain Sight: The Hermann Klein Phono-Vocal Method Based upon the Famous School of Manuel García (VoiceTalkPublications 2013). There, I demonstrated that García, Lamperti's great rival, recognized the "effect" of voice placement even if he focused on its "cause." I also showed—for those curious enough to read the footnotes that accompany my text, that voice science, i. e. acoustical research, is catching up with historic teachings. 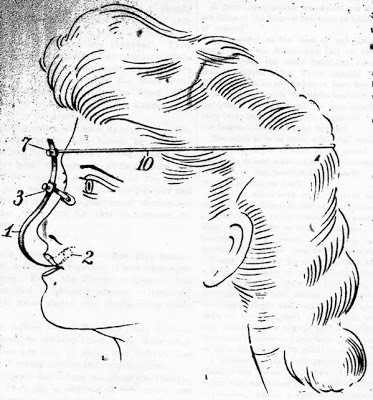 Note: The "voice placer" image comes from an issue of "Musical Courier," and illustrates the lengths to which teachers of singing have mistaken cause for effect.